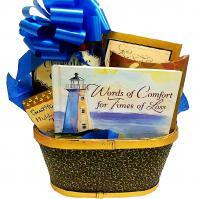 Beautifully designed, visually uplifting sympathy baskets comfort grieving friends during times of loss. 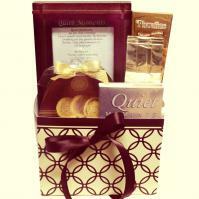 Allow our stylish sympathy gift basket arrangements to deliver your message of condolence and respect. When someone you care about experiences the loss of a close family member, a good way to show you care is to send a sympathy food basket. Adorable Gift Baskets offers a meaningful collection of bereavement gift baskets to help you express condolences during difficult times. When someone passes on, it can be difficult to find just the right words to say to their closest friends and family. 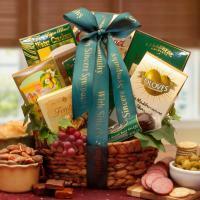 But with our elegant sympathy food baskets, you can show you care without saying a word. You can opt to have a sympathy gift basket delivered to their doorstep, or you might prefer to deliver it by hand as you visit with the family. Adorable Gift Baskets offers large sympathy food baskets if you'd like to provide appetizing snacks for visiting friends and family, or smaller baskets if you would rather give a personal gift to the spouse, parent or child of the deceased. 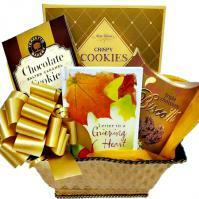 Browse our site to find numerous sympathy food baskets, flower arrangements, gift mugs and more by Adorable Gift Baskets. It's easy to find a lovely basket filled with your loved one's favorite comfort foods. With our helpful search features and convenient shipping offers, you'll be able to offer your deepest sympathy at an affordable price. A sympathy note is the note that nobody ever wants to be in a position to write, and the note that nobody ever wants to be in a position to receive. However, when the sad occasion of a death arises, a sympathy note is an important form of emotional support for the bereaved. Thereís no need to be afraid of writing one of a sympathy message, even if you arenít any good at writing. Below are tips about how to write a sympathy message, what to include, and when to send a sympathy letter. Keep your sympathy message short and simple. This is not the time for creativity. You may add a short second paragraph, if you wish, to share a fond memory of the deceased or to mention a particular trait you held in high regard. Sometimes it is tempting to make religious references in a sympathy note. Unless you are certain that you and the bereaved share exactly the same religious idea, leave it out. You can always discuss such things later. The one exception to this is to say that the bereaved, the deceased, and the family are in your prayers. When do you send a sympathy note? The answer to this one is simple: write it as soon as you find out about the death. If you know about the bereavement when it happens, write and send the note as soon as you can. That might be the same day, or it might be the next day. If the news reaches you six months or a year later, send the sympathy letter at that time. If you are in a position to offer specific help (providing some meals, babysitting the kids, or whatever you are prepared to do) make that offer in the letter. Do not say, "let me know if there is anything I can do". The older etiquette books indicate that a certain type of stationery must be used. You are not likely to have this on hand. Write the note on a notecard or a piece of typing paper. It is best to write the note by hand and send it by the USPS. Send it by email only if absolutely necessary. The important bit is to send it quickly. "Dear Adorable Gift Baskets, I just wanted to write and tell you how quickly your customer care consultant acted on behalf of your company after the death of my beloved sister. Your conscientious customer care has saved us such an incredible amount of hassle and trouble trying to get gifts out. Thank you for a job well done. Sincerely Mary Dowling, Marketing & Creative Services"